For best gaming experience, you need a monitor with higher refresh rates to have smooth game-play in fast paced games. Most of the budget monitors comes with typical 60Hz refresh rate which is a bit on the lower side for gaming, especially for action packed FPS games and racing games. If you have a good mid-range or higher mid-range graphics card installed in your gaming PC, but a 60Hz / 75Hz monitor then you may experience motion blur in most of the fast-paced games and this can ruin your whole gaming experience. This is because your monitor will not be able to cope up with the higher frame rates thrown by your graphics card (above 100 FPS) resulting in motion blur, ghosting, especially in fast action first person shooter games like Counterstrike, CS:Go or high-speed car or bike racing game. Also, you will get less frames delivered on your screen with a 60Hz monitor because if you are getting 120FPS in a game and you have 60Hz monitor then your display will only be able to display half of the frames. 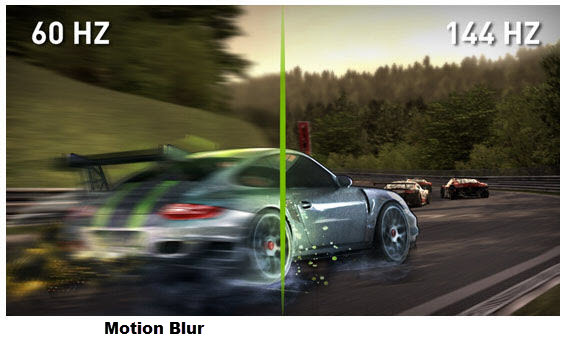 Motion blur causes fast moving objects to appear out of focus, blurry or jaggy on your computer screen. You can see the motion blur in a 60Hz monitor in the image given below. To fix this motion blur you need a monitor with higher refresh rate so that it can easily handle higher frame rates in games. A monitor with 144Hz refresh rate is recommended for mid-level or high-end gaming, but these monitors are generally expensive than the regular 60Hz or 75Hz monitors. They can easily deal with up to 144 frame rates per second and provides smoother gameplay. Also, because of higher refresh rate there is very less input lag in 144Hz monitors thus providing fluid gameplay. 144Hz monitors do also eliminate screen tearing in games to good extent but to fully eliminate or reduce screen tearing in games, you will need variable refresh rate technologies like Nvidia G-Sync or AMD FreeSync in your monitor. Screen tearing happens when your monitor refresh rate is not in sync with frame rates rendered by the GPU. 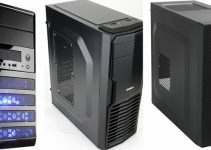 Here in this post, I am going to list down the best budget 144Hz monitors so that you can have a smooth gaming experience. 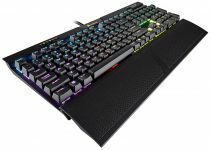 I have also compiled a list of best G-Sync and FreeSync monitors, which you can find by going to the link given below. Here are the best budget 144Hz monitors that you can buy for your gaming PC. These are all Full-HD monitors supporting 1080p resolution. This is one of the cheapest 144Hz monitors that you buy for your gaming PC. 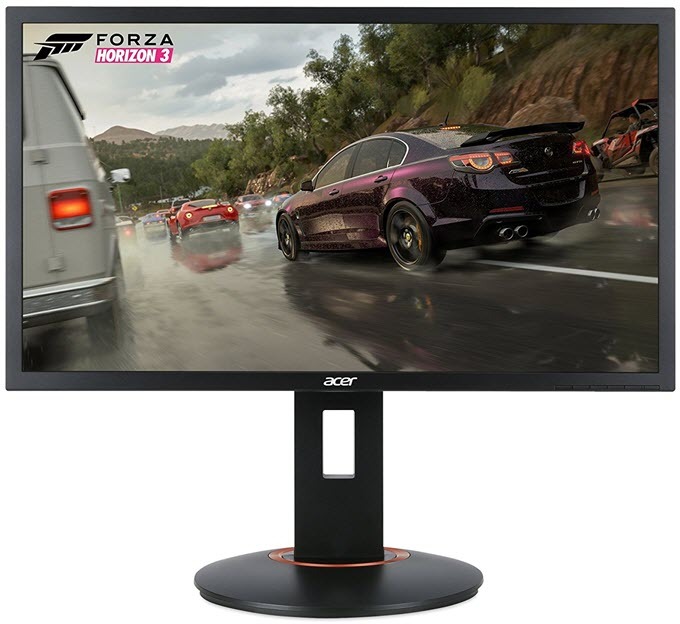 Acer GN246HL Bbid is Full HD 24-inch LED monitor having maximum refresh rate of 144Hz and pixel response time of 1ms for eliminating ghosting and motion blur in fast action paced games. The monitor is slim, good looking and has got a very stable and stylish stand (X-shaped). The monitor can be tilted upwards and backwards (-5° to 15°) but lacks height adjustment. It has got a TN Panel and has pretty good viewing angles for a TN display panel type. This 144Hz monitor from Acer supports NVIDIA 3D Vision and NVIDIA 3D LightBoost technologies for an amazing 3D experience, both in 3D Gaming and Video Viewing. The monitor is also very power efficient and consumes only 23W when in operation. On the back of the monitor you will find VGA, DVI and HDMI ports, but to take the advantage of 144Hz, you should use DVI cable to connect the monitor to your graphics card or display adapter ports. Overall, it is a value for money and affordable 144Hz monitor that goes easy on your pocket. 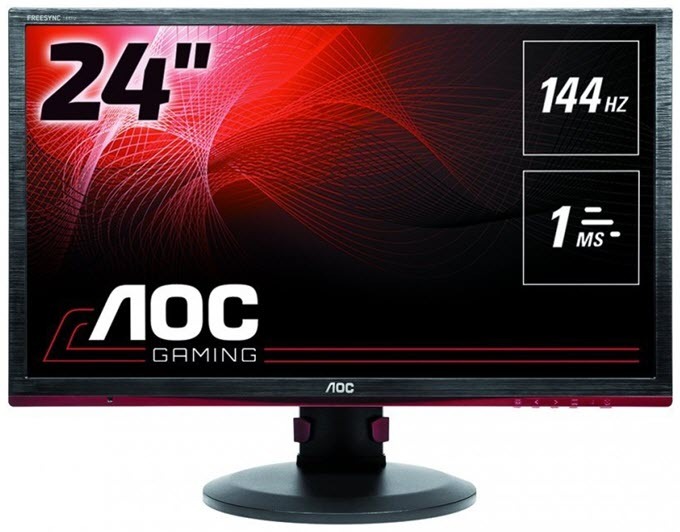 AOC is a brand that is well known for its computer monitors. Here from it we have AOC G2460PF 24-inch Full HD gaming monitor having refresh rate of 144Hz and pixel response time of 1ms. This is a great budget gaming monitor (with TN panel) and it also supports AMD FreeSync. This means if you have an AMD Radeon graphics card then you can take advantage of AMDs FreeSync technology and eliminate screen tearing completely in all games. The monitor performs excellent in all games offering super smooth gameplay and has very low input lag. This 144Hz gaming monitor from AOC has got inbuilt 2W speakers. The monitor has got a stable stand and can be adjusted for height, swivel and tilt. The monitor has very low power consumption and it offers great color reproduction. It also comes with four USB output ports and a headphone jack. Display connectivity options include VGA, DVI, HDMI and DP ports. So, if you are looking for a cheap gaming monitor having 144Hz refresh rate and AMD FreeSync support then it is very hard to find anything better than this. Highly Recommended by me. Another Acer monitor but this one is a bit better and offers extra features over the above mentioned Acer GN246HL Bbid monitor. 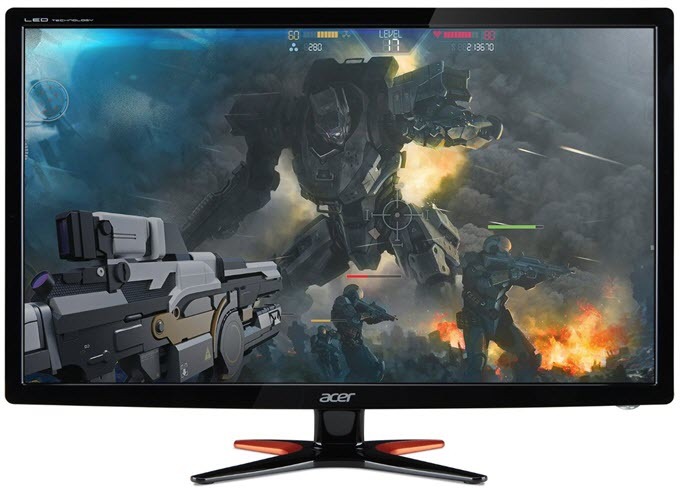 Acer XFA240 bmjdpr is a 24-inch FHD gaming monitor having 144Hz refresh rate and ultra low 1ms pixel response time. This is a TN panel LED monitor having aspect ratio of 16:9. It has got a round stable stand and it provides adjustments for tilt, swivel, pivot and height. This budget 144Hz gaming monitor comes with two 4W speakers that are pretty decent in sound output. To reduce screen tearing and stuttering in games, the monitor supports AMD FreeSync technology which you can utilize by having an AMD graphics card in your gaming PC. The power consumption of this budget gaming monitor is also on the lower side. Connectivity options include DVI, HDMI and DisplayPort. Overall, a great affordable gaming monitor that delivers very good performance and is also good looking. 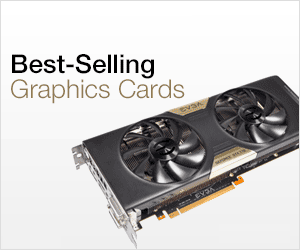 MSI is known worldwide for its gaming hardware & components that includes graphics cards, motherboards, gaming desktops & laptops, monitors and accessories. 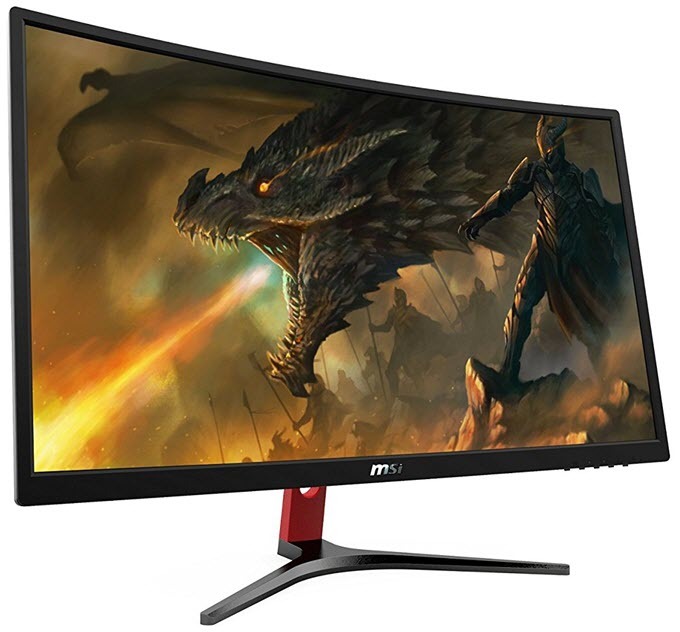 Here we have got MSI Optix G24C which is a 24-inch gaming monitor having 144Hz refresh rate and 1ms pixel response time. This monitor has got curved display panel and has maximum resolution of 1920 x 1080 pixels. The monitor is well built and has got a solid stand but can be adjusted for tilt only. It lacks height adjustment which is a bit of downside of this gaming monitor. The monitor supports AMD FreeSync technology to reduce screen tearing in games using AMD Graphics card that supports FreeSync. The monitor also has very good color accuracy. Other features include FPS Front Sight design, Less Blue light design, Wide gamut coverage, Samsung curved panel, Wide View angle, 1800R curve panel design. Connectivity options include DVI, HDMI and DisplayPort. So, if you want a well-built budget curved gaming monitor with 144 hertz refresh rate then you should definitely go with this one. 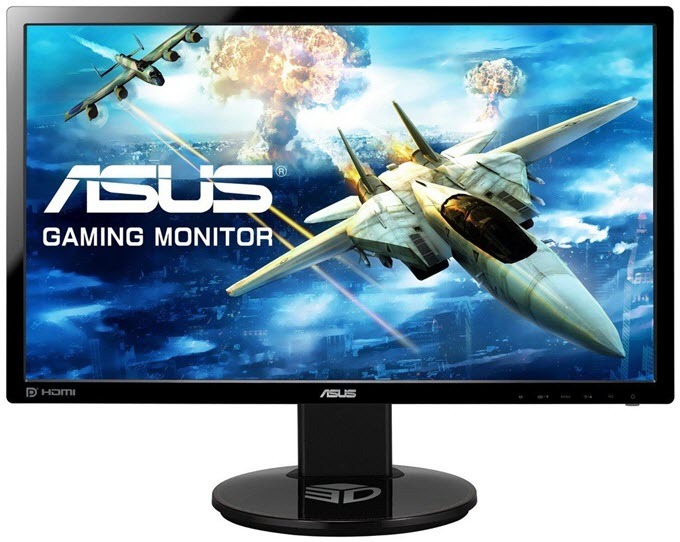 ASUS VG248QE is one of the best 144Hz gaming monitors that you can buy in affordable price segment. The monitor is a bit costly than the other budget 144Hz monitors in this list but it is worth every penny. The monitor has simple design, yet it looks very classy and beautiful. It has very slim bezels and an oval stand which is very stable and holds the monitor very well. It has adjustment for height, tilt and swivel. This is a Full HD monitor having a TN panel and 1ms response time. The display quality of this monitor is great and offers vibrant and accurate color reproduction. It also has quite good viewing angles for a TN panel. Gaming on this monitor is fun and you won’t get any input lag, motion blur or stuttering on this gaming monitor. It offers ultra-smooth gameplay in all games whether they are action or racing games. It also features the ASUS-exclusive GamePlus (Patent-pending) hotkey with crosshair (aim-point) and timer functions. You can choose from the four in-built cross hairs and dominate in action packed FPS games. Other features include NVIDIA 3D Vision support, Splendid Video Intelligence Technology that comes with 6-preset modes, 3.5mm mini-jack and in-built two 2W stereo speakers. The main thing that is lacking in this monitor AMD FreeSync because you can find it in some monitors that are already in this price range. Display connectivity options include DVI, HDMI and DisplayPort. Highly Recommended by me. 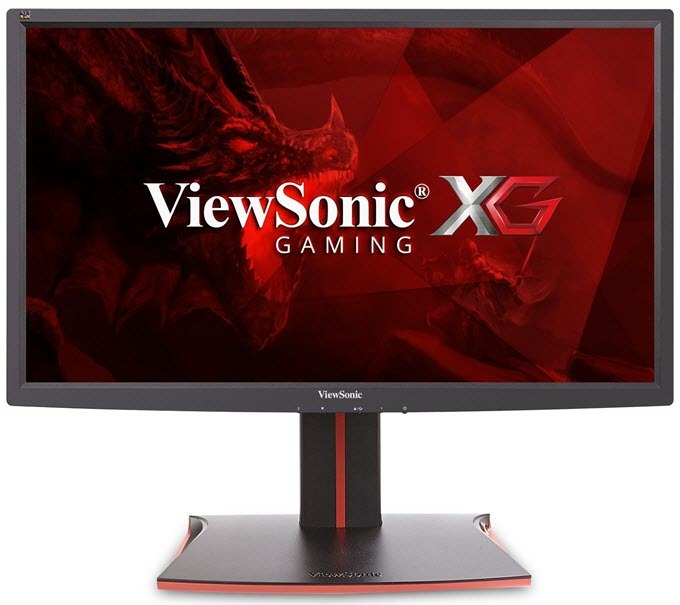 ViewSonic is a brand that specializes in monitors and here from it we have a very good 24-inch gaming monitor, which is ViewSonic XG2401. This is a pretty great gaming monitor that comes with 144Hz refresh rate, 1ms pixel response time and supports AMD FreeSync technology to eliminate screen tearing in games for super smooth and fluid gameplay. This is a 1080p monitor and has got TN panel with LED backlight. It comes with a solid stand that has adjustment for height, tilt and swivel. The display quality of this gaming monitor is very good and viewing angles are also good for a TN panel. This 144Hz monitor comes with two 2W internal speakers. 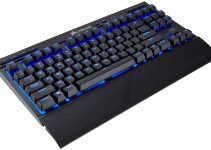 Other features include Black Stabilization, Kensington lock slot, VESA support, Cable Management Ring and Game Mode that optimizes visuals for FPS, RTS and MOBA. It also includes two USB 3.0 Type and one USB 2.0 Type A ports. The display connectors in this monitor include two HDMI and one DisplayPort. To take advantage of higher 144Hz refresh rate, you should be using DisplayPort to connect to your computer video adapter or graphics card. VIOTEK is a brand that most of you never heard of. 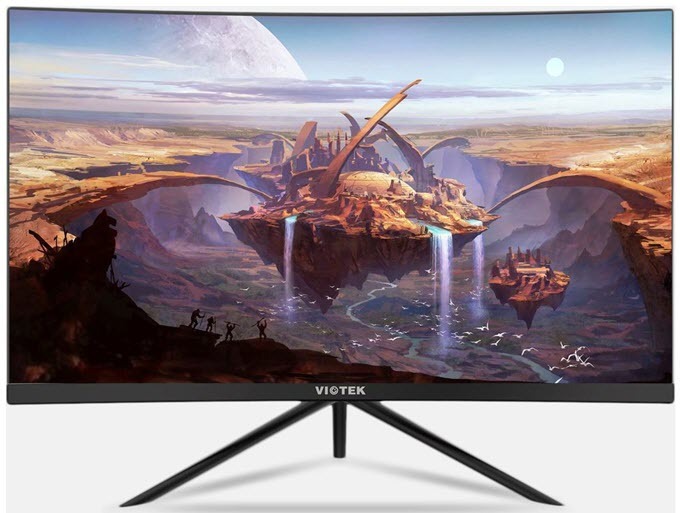 However, it does offer a good feature rich budget gaming monitor in form of VIOTEK GN24C. This is a 24-inch FHD Curved gaming monitor having 144Hz refresh rate and pixel response time of 3ms. The 3ms response time may seems a bit higher but in reality it does not affect the performance of monitor in games. The monitor has got VA panel that has much better color reproduction, picture quality and viewing angles compared to a regular TN panel. This a beautiful looking monitor with bezel-less deign and has got a tripod type stand, which is quite sturdy. It can be adjusted for tilt but not for height, which may a bit of issue for some people. This gaming monitor supports AMD FreeSync so as to reduce screen tearing and stuttering in games. Other features include low blue light emission, GamePlus mode (for crosshairs) and VESA wall mount support. Connectivity options for this monitor includes one HDMI and one DisplayPort. Overall, it is a great budget 144Hz monitor for gaming that has excellent picture quality. Highly Recommended for budget oriented users. 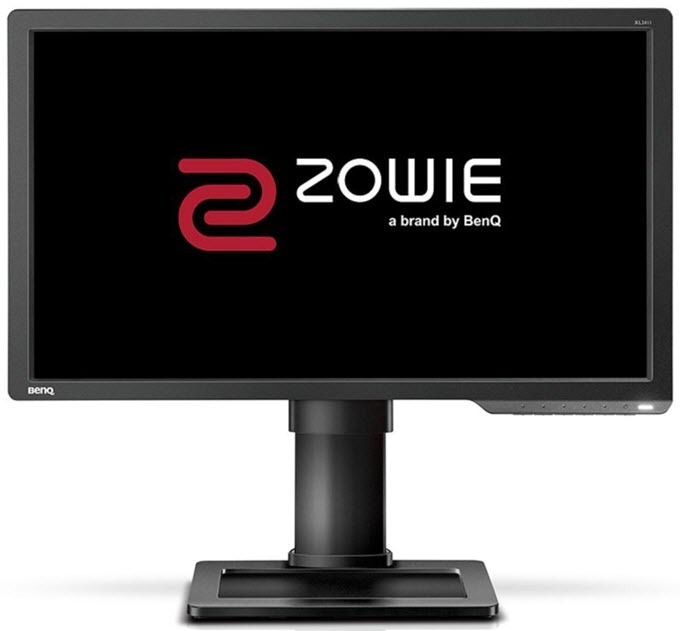 BenQ ZOWIE XL2411 is an amazing 144Hz monitor that is suited for e-Sports as well for other games. This is also a 24-inch Full HD gaming monitor having refresh rate of 144Hz and 1ms pixel response time. The monitor has got TN panel and has got very stable square shaped stand that can be adjusted for height, tilt and swivel. The monitor has got slight thick bezels, but the build quality of the monitor is top notch. This BenQ 144Hz gaming monitor comes with features like Black eQualizer, Low Blue Light‎, Flicker-free, K Locker‎, Game Modes, VESA mount support and Headphone Jack. Display Connectivity options include VGA, DVI and HDMI port. 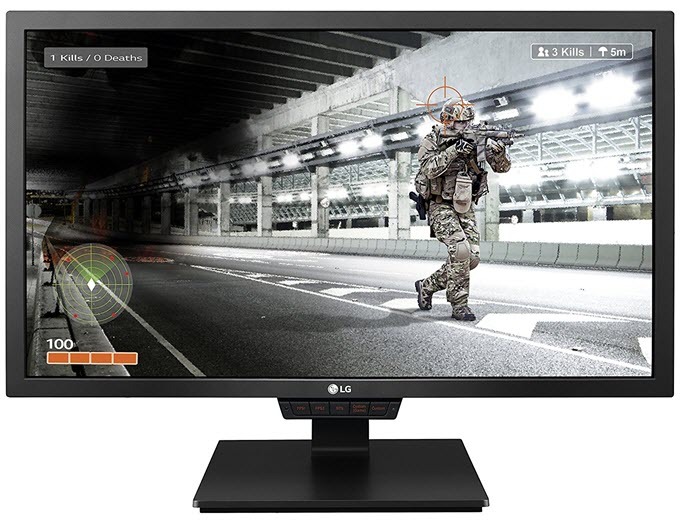 Now from LG we have LG 24GM79G-B which is 24-inch FHD gaming monitor having TN display panel. The monitor has got refresh rate of 144Hz but a bit higher response time of 5ms (GTG). It is a simple looking monitor and has a squarish stand that has adjustments for height, tilt and swivel. The monitor supports AMD FreeSync which you can take advantage of by pairing it with a good AMD graphics card. Other features include Dynamic Action Sync, Black Stabilizer, Game Mode Hotkeys, Key Lock, Flicker Free, Smart Energy saving, 4 Screen-split, HDCP support, Anti-Glare 3H Surface Treatment. Connectivity options include HDMI, DisplayPort and two USB 3.0 ports. This isn’t the best 144Hz monitor in this list but it is quite a feature rich monitor and has the reliability of LG. So, if you are looking for a good budget 144Hz monitor for your gaming needs, then the above mentioned monitors will not disappoint you at all. These 144Hz monitors will really makes your gaming experience a whole lot smoother and fluid. Some of the above mentioned monitors also support AMD FreeSync, which can eliminate screen tearing in games thus making your gaming experience even better. If you have any suggestions or doubts regarding these monitors, then you can reach me by leaving a comment below.